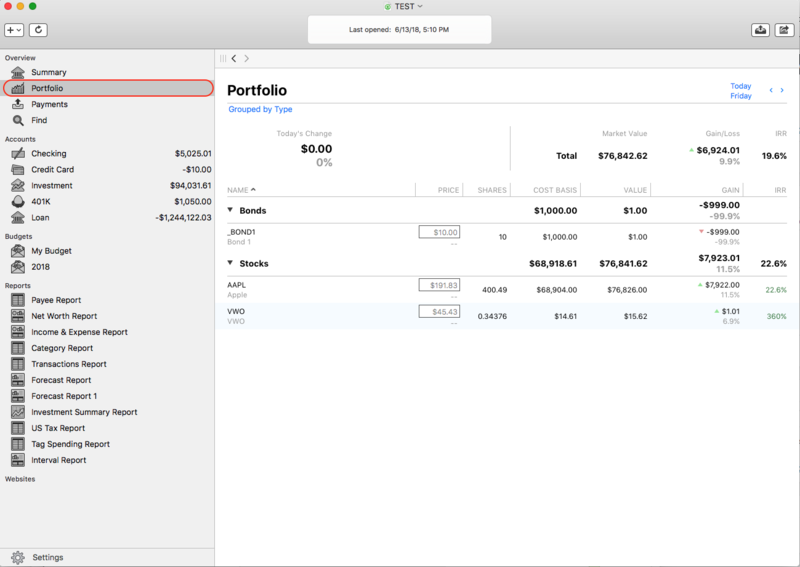 Problem: I just setup my investment accounts but the balances are all wrong and I don’t understand why. 1) Cash Balance: This figure reflects the amount of cash in your brokerage account only. In most cases, cash is not actually held in your brokerage account for long – when you purchase shares of a stock, you transfer the money to your broker and then it is immediately spent to purchase the securities. When you receive money from the sale of a stock, the money is immediately transferred into a savings or other account. In most cases, the cash balance of your investment accounts will remain at 0. This figure is shown in the “Balance” column in the account register. When you create a buy transaction for example, Banktivity will calculate the transaction share price, shares in and commission for the transaction total. On the left side of the register the Distribution (funding source) will determine where this cash is drawn from. If set to cash, this tells Banktivity the funds are on hand in the account. If there is no cash balance in the account, your balance will show negative. Your options are to transfer funds to the account from another account (Banktivity tries to reflect the real world movement of funds), or if you prefer not to, set the Distribution (funding source) to transfer, and leave the category blank. This informs Banktivity that the cash was supplied from another source, but not to track where from. 2) Total Value: This figure represents the combined worth of the cash value of the brokerage account and the market value of your investment portfolio. The market value is an estimate based on the latest quotes Banktivity has downloaded for your securities. You can view the market value by creating a Portfolio Summary report. The total value of each investment account is displayed below the account’s name on the far left side of your document. 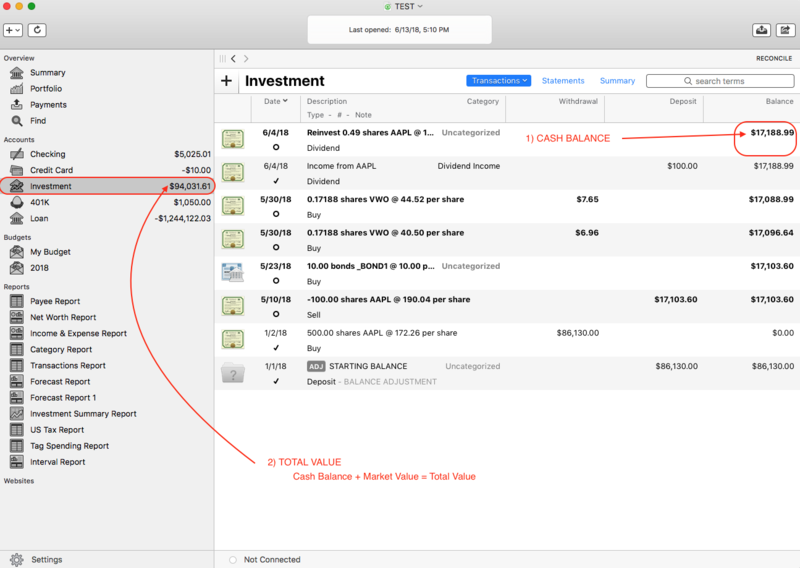 The screenshot below illustrates where to find the cash balance and total value of each investment account. If you’ve looked at each of those items and are still seeing the wrong balances, the next place to look is at the Portfolio report to make sure each of your securities are showing the correct total number of shares you hold, along with the correct price per share. The Portfolio report can be found on the left side of your document above your list of accounts as shown in the screenshot below. This entry was posted in Banktivity 6, Banktivity 5 and tagged Accounts, Investments.